ST. LOUIS, April 25, 2017 /PRNewswire/ -- For two decades, the Purina Pro Plan Incredible Dog Challenge (IDC) has been giving competitive canine athletes a stage to demonstrate their amazing abilities in Olympic-style events around the country. To celebrate the 20th anniversary of the IDC, Pro Plan is partnering with Tennis Hall of Famer Andy Roddick to kick off the "Call for Incredible" campaign to highlight all the ways dogs are "incredible" and call on dog owners to share their own stories. For every entry in the Call for Incredible Sweepstakes on proplan.com/incredible, Purina Pro Plan will make a donation to America's VetDogs, to support the "incredible" and important work they do with service dogs and veterans with disabilities. "Call for Incredible" is a year-long celebration showcasing all kinds of incredible dogs – from canine athletes like Incredible Dog Challenge competitors, to military dogs, and lovable couch companions like Andy Roddick's two English bulldogs, Bob Costas and Billie Jean. Purina Pro Plan is calling for dog owners to share a photo and story on what makes their own dog incredible by visiting proplan.com/incredible. Here, dog lovers can also enter for a chance to win a trip to San Diego during Veterans Week in November to attend a special Incredible Dog Challenge on the historic USS Midway Museum, featuring some of the most incredible canine athletes and working military canines in the country. And for every entry, Purina Pro Plan will donate one pound of dog food, up to 20,000 pounds, to America's VetDogs, which trains and places guide and service dogs to veterans with disabilities. "The Incredible Dog Challenge is more than a competition; it's a passionate community of dog owners, who feel the same way that we do – that all dogs are capable of amazing things," said Christi Maginn, Brand Director, Purina Pro Plan. "'Call for Incredible' gives us the chance to celebrate 20 years of these amazing athletes, as well as the incredible dogs that have impacted our own lives." The "Call for Incredible" campaign will also highlight incredible dogs whose lives are dedicated to helping military veterans, such as the guide and service dogs that work with America's VetDogs. America's VetDogs recognizes the powerful impact dogs can have on a person's life and is committed to training and placing assistance dogs with veterans to help better their quality of life. "We're excited to partner with Purina Pro Plan to highlight the impact that highly-skilled service dogs can have to help veterans live with dignity and independence when they return from duty," said Wells B. Jones, CEO from America's VetDogs. "We know they are incredible and deserve recognition for the unwavering love, companionship and care they provide to their owners." Purina Pro Plan is committed to delivering high quality nutrition to help fuel dogs so they can do the incredible. Whether they're jumping off docks, opening doors or napping on the patio, there's a Pro Plan formula specially designed to fit each dog's specific needs. Purina Pro Plan is dedicated to helping promote healthy living in dogs of all ages and activity levels through nutrition that performs. For more information on the Purina Pro Plan Incredible Dog Challenge or "Call for Incredible" campaign, visit www.proplan.com/incredible. Purina Pro Plan is the food of choice for 10 of the past 11 Westminster Best in Show winners*. Our goal is to give your dog the nutrition to be his absolute best, helping him to be energetic and resilient, and maintain an ideal body condition, healthy skin, and a stunning coat. Because being the best he can be means something different for every dog, our wide range of dry and wet foods and snacks, sold exclusively at pet specialty stores, can be found in five specialized categories formulated for a dog's unique needs. For more information, visit www.proplan.com or follow @ProPlan on Twitter, Instagram, Facebook, or Google+. The brand is manufactured by Nestle Purina PetCare, which promotes responsible pet care, humane education, community involvement, and the positive bond between people and their pets. A premiere global manufacturer of pet products, Nestle Purina PetCare is part of Swiss-based Nestle S.A., a global leader in nutrition, health, and wellness. *Handlers or owners of these champions may have received food or compensation as a Purina ambassador. Since 2003, America's VetDogs (www.VetDogs.org) has trained and placed guide and service dogs to provide independence, enhanced mobility, and companionship to veterans with disabilities from all eras. In 2015, VetDogs opened its programs to first responders, including fire, police, and emergency medical personnel. America's VetDogs is a 501(c)(3) not-for-profit organization founded by the Guide Dog Foundation. VetDogs relies on contributions from generous individuals, corporations, service clubs, and foundations to fund its mission to help those who have served our country live with dignity and independence. It costs over $50,000 to breed, raise, train, and place one assistance dog, but America's VetDogs provides its services completely free of charge to the individual. Be sure to catch Charlie, the VetDogs 'Puppy with a Purpose' daily on NBC's TODAY. America's VetDogs has been accredited by both the International Guide Dog Federation and Assistance Dogs International. The USS Midway Museum is a 501(c)(3) nonprofit organization established in 1992. The Museum opened in June 2004. It is governed by a board of directors. Its vision is to become America's living symbol of freedom, and its mission to preserve the historic USS Midway and the legacy of those who serve, inspire and educate future generations, and entertain museum guests. NO PURCHASE NECESSARY. Sweepstakes begins 12:00:01 a.m. ET on 4/17/17 & ends 11:59:59 p.m. ET on 9/30/17. Open to 50 U.S./D.C. residents who are at least age 21 in MS, age 19 in AL/NE or age 18 in other states/D.C. at the time of entry. 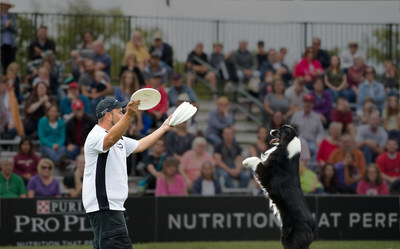 To enter & for prizes, odds & full Official Rules, go to www.ProPlan.com/Incredible. Void outside 50 U.S./D.C. & where prohibited. Sponsor: Nestlé Purina PetCare Company. Beginning at 12:00:01 a.m. ET on 04/17/2017 and ending at 11:59:59 p.m. ET on 09/30/2017, Nestlé Purina PetCare Company ("Purina") will donate one (1) pound of food to America's VetDogs for each entry into the Purina Pro Plan Call for Incredible Sweepstakes, with a minimum donation of 10,000 lbs. and a maximum donation of 20,000 lbs. of food. For more information about America's VetDogs, please visit www.vetdogs.org.